WE are all familiar with Oliver Goldsmiths poem, The Deserted Village, that records with poets sensitivity the changes that transformed an English village during the industrial revolution in 1700s. 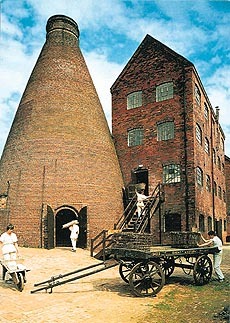 The birthplace of the industrial revolution was a town, now called Telford in the Shropshire county in England. Telford is a town with immense natural beauty, a gorge with the river Severn flowing through it. The symbol of industrial revolution today is an ironbridge across the Severn, which was cast between 1771 and 1781. It was first cast ironbridge in the world and is a direct ancestor of every substantial iron or steel framed structure of the present day. 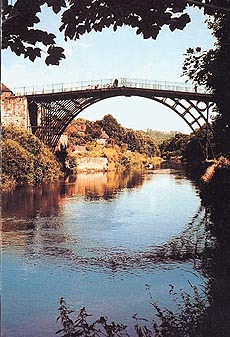 Ironbridge today is synonymous with the town of Telford. It is the focal point of the area and has been the centre of attraction for over 200 years. Ironbridge attracts people from all parts of the world. As tourists take delight in the natural beauty of the gorge, they also marvel at the enterprise, the imagination and achievements of those who lived here two centuries ago during the industrial revolution. The Ironbridge gorge lies within the Coalbrookdale coalfield, a region that is richly endowed with minerals, coal, iron ore, limestone, sand and` useful clays. This rich natural resource along with human enterprise led to a series of dramatic changes which historians have called the industrial revolution. Ironbridge still retains some of the atmosphere of the period during the industrial revolution. Bridges, furnaces, warehouses, inclined planes, mansions and cottages from the time of industrial revolution dominate the landscape. Many of these buildings have cast iron window frames, lintels and even chimneys. The garden walls made up of kiln bricks, lumps of furnace slag and nodules of iron ore indicate the kind of material that was once abundant at the place. Even roadsides are lined with slag, which is the waste product of blast furnaces. It was during the 1600s that local landowners began to exploit coal on a large scale. During this time wooden railways were built to carry coal from the mines to the banks of the Severn. Skilled people like potters, salt boilers, lead smelters, glass makers, blacksmiths, rope makers and basket makers from all over the country moved to this area and made their homes along the slopes of the gorge. By the year 1700 there were several furnaces in the area all of which used waterpower to work their bellows and charcoal as their fuel. In the year 1709, the ironmaster, Abraham Darby, first smelted iron using coke as fuel. This was a momentous development, which ultimately made possible a vast increase in iron production in Britain. As goldsmith has mentioned in his famous poem. At the end of 18th century about a quarter of all the iron produced in England was being smelted in and around the Ironbridge gorge, and massive structures like the Ironbridge and Benthall water wheel came up. There was also a spurt in industry making iron cylinders for steam engines; iron wheels and iron rails for railways and also the first iron framed building in 1796-97. The place was celebrated for its ornate garden seats, ceremonial gates, statues and other art castings. Along side other crafts, china works and candle making flourished. The steam engines and porcelain tiles began to be exported. These were the heydays for this industrial town. However, there is a darker side to the history of Ironbridge as well. Before the Mines Act of 1842, boys as young as ten worked in coal and iron pits and at blast furnaces and girls that age worked as burnishers at the china making factories. After 1810, the Ironbridge George ceased to be celebrated for its innovations. Other iron working areas overtook Shropshire in importance. After 1870, the local iron trade collapsed and furnaces with mines that supplied them closed down. The area once hub of industrial activity, slipped into oblivion. in the background. You can even taste the butchers pies and smell candles in the candle factory. At the Shelton Toll house, volunteers dress up in clothes of 18th century fashion and display lifestyle by actually going about household chores in the museum house. In addition, the Museum Trust has educational activities at the Coalbrookdale campus. There is a well-stocked library, which has valuable material on history of Industrial Revolution. Here in collaboration with Birmingham University students can study for a diploma in industrial archaeology or a masters degree in social sciences. For its such unique and varied activities. 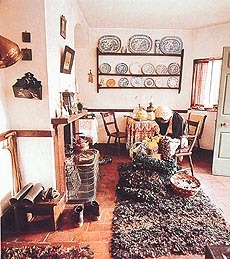 The Ironbridge Gorge Museum was awarded the European Museum of the year Award in 1975. The events of the 18th century at Ironbridge were a part of the Industrial Revolution, a scene of remarkable break- through which led Britain to become the first industrial nation and workshop in the world. This is indeed Britains unique contribution to world history. Ironbridge is as important to history of our civilisation as Athens, Rome or Jerusalem and best place to gain understanding of the origins of industry.